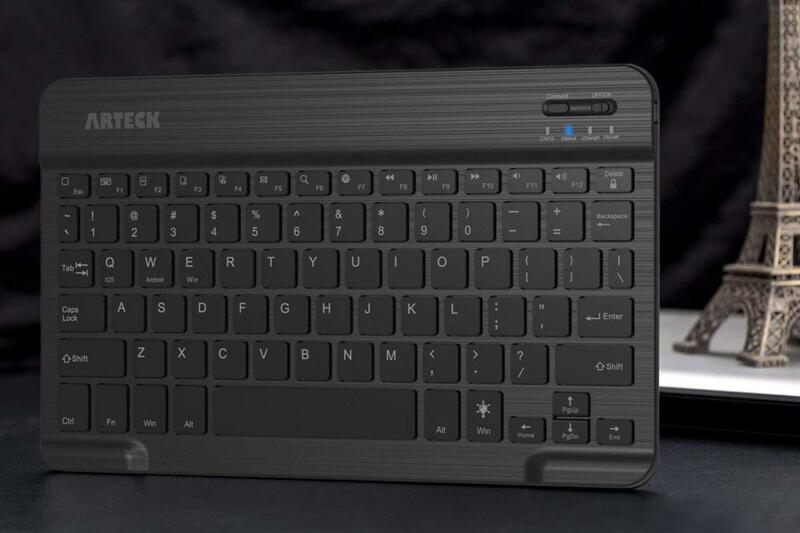 The thin-and-light Arteck HB030B Wireless Bluetooth Keyboard arms road warriors with a single input for their devices. Supporting the four major commercial operating systems (Windows, MacOS, iOS, and Android), this keyboard provides a fairly comfortable typing experience and a little pizzazz with multicolored backlighting. Note: This review is part of our best wireless keyboard roundup. Go there for details about competing products and how we tested them. The compact Arteck keyboard measures 9.7 x 5.9 x 0.24 inches and weighs less than half a pound, making it an ideal travel companion. It’s powered by a rechargeable lithium battery and includes a USB charging cable. Arteck claims a single charge will give you up to six months of battery life, provided you only use it for a couple of hours a day with the backlight turned off. That further underscores that this is meant to be an out-of-the-office solution, not your daily driver.